It is difficult to deny the importance of energy efficiency when designing and building a new home. Whether you are environmentally conscious or seeking to save money on utilities, the appeal of energy efficient homes is nearly universal. In the world of timber framing, however, it is not a new concept. 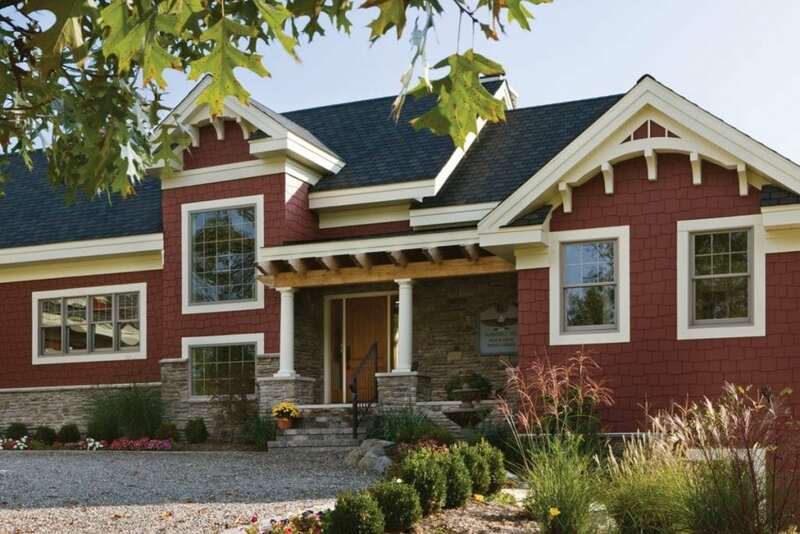 Riverbend Timber Framing has been designing and crafting energy efficient homes for over 40 years. Incorporating energy efficient materials and methods into our timber frame homes is so popular that some homeowners now choose to go beyond energy efficiency; they aim for certification. This article outlines Riverbend’s approach to energy efficiency in a timber frame home—and how our process can easily incorporate your desire for certification—be it the United States Green Building Council LEED® program, the Canadian Natural Resources EnerGuide, or something else. 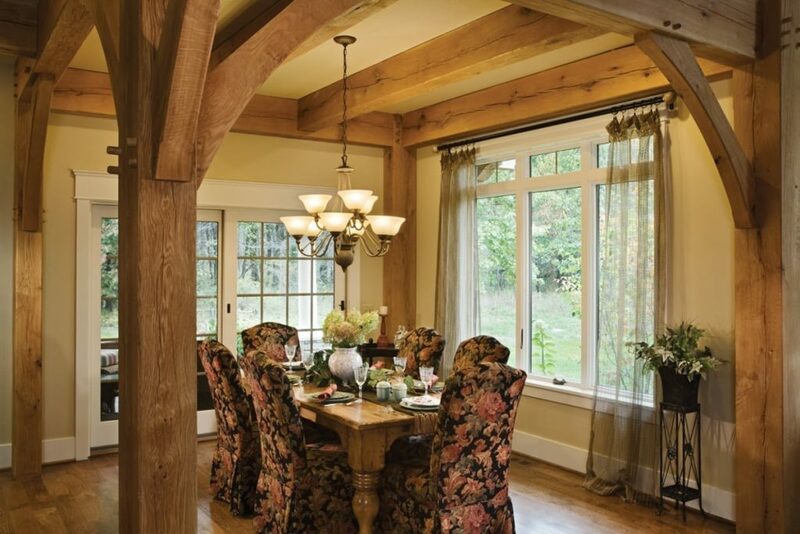 Riverbend’s timber framing is known for traditional, mortise and tenon connections. However, the individual timbers of your home are not the only elements of the design that beautifully fit together. Your Riverbend home has a complete energy efficient structural shell. This structural envelope is comprised of products that are part of the PFB corporate family of building solutions. These include structural insulated panels and insulated concrete forms. Riverbend uses Insulspan® structural insulated panels (SIPs) and the Advantage ICF System® in your home. (ICF refers to insulated concrete forms.) Combined, SIPs and ICFs create a complete structural shell that is highly energy efficient. This is partially because the expanded polystyrene (EPS) foam used in SIPs and ICFs has a higher rated R-value [i] than traditional fiberglass insulation products. Thus the insulating capabilities of your Riverbend home can significantly exceed that of homes using batt insulation. By investing in high quality construction techniques, such as SIPs and ICFs, you take advantage of energy savings in both the short and long-term life of your home. In the short-term, a Riverbend home built with SIPs and ICFs reduces the size and cost of the HVAC system needed for your home. Professionals work to properly calculate your home’s heating and cooling loads, size your HVAC system, and optimize the sizing of your home’s duct work. SIPs and ICFs also reduce construction timelines and thee number of subcontractors needed to build the structural shell of your home. These two items translate to money saved. In the long-term, your energy efficient Riverbend home, with its properly size HVAC system and ducts, combines with your complete, insulated shell to become a crucial factor in receiving an energy efficiency certification for your home. Using SIPs and ICFs in construction helps place your home on the right path to certification. Additionally, Riverbend’s experienced team assists you in understanding other aspects that may be required by individual programs. The assistance our team provides to you begins with the design process. Thus, it’s important you discuss your goals for energy certification at your first design meeting. In order to determine the level of energy efficiency your home needs to achieve to be certified, it is recommended you take advantage of programs offered by certified third parties. There are several well-known programs that you can avail yourself of, each maintaining its own standards and methods for determining a home’s energy efficiency. These third party programs include ENERGY STAR®, and the aforementioned USGBC LEED® and EnerGuide. One Calgary-area couple is a perfect example of how to work with Canada’s EnerGuide program. 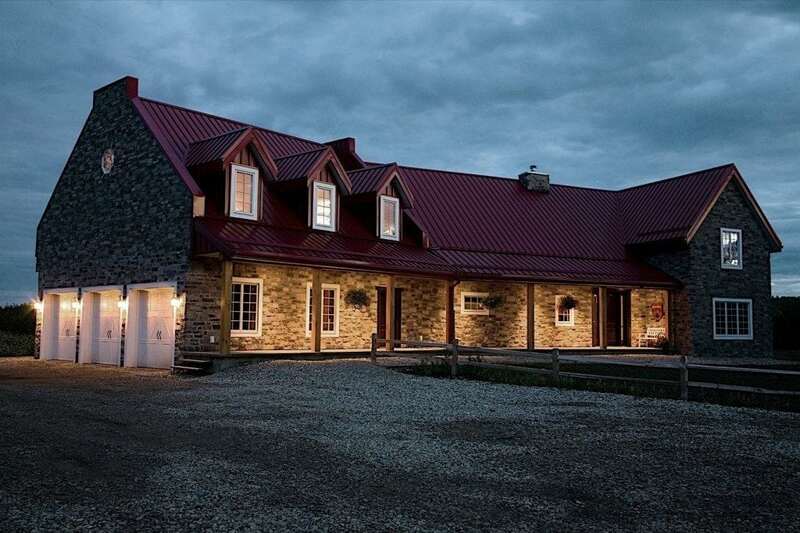 These Alberta clients wanted to build a unique, timber frame farmhouse. And, with the cold climate of their region, they were unwilling to compromise on energy efficiency. By working within EnerGuide guidelines, they were able to achieve a rating of 86 on their EnerGuide home evaluation. This astonishing rating occurred at a time when anything above 80 was evaluated as “excellent” and 90 or higher was considered a zero-energy home. In the United States, Riverbend client, Bob Burnside, sought to attain certification for his Michigan home. 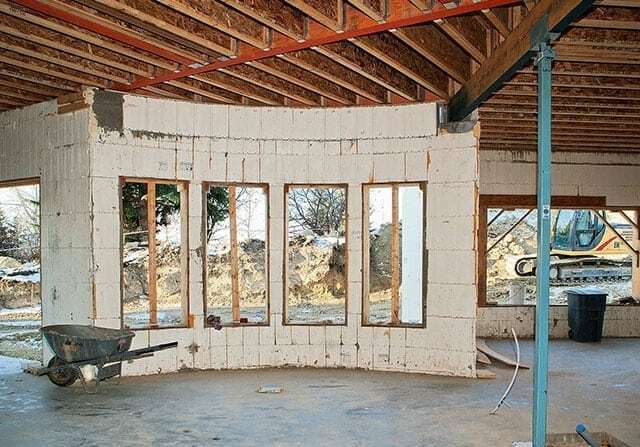 In addition to the structural insulated panels (SIPs) that comprised the exterior walls and roof, his home used insulated concrete forms (ICFs) in the basement. Going a step further, Bob’s home design included two geothermal systems to manage the internal climate and solar panels. With these inclusions his timber frame home achieved platinum level certification from the USGBC’s LEED® certification program—the highest possible level. For most Riverbend homeowners, the decision to build a traditional timber frame home that is also certified, is an investment in the future. Their homes are built to be enjoyed for a lifetime, and even to be passed on through generations of family. For other clients, a not insignificant benefit of owning a certified energy efficient home manifests when the decision is made to sell the residence. In short, certified homes tend to realize a larger selling price regardless of the home’s location. The many potential benefits of owning a certified home– including the minimized environmental impact, tax incentives, money savings, and healthier living space– can increase your home’s potential resale value. Over the years, Riverbend has assisted a number of clients in meeting the criteria for various green home programs. Our team of experienced professionals is available to discuss your project possibilities. If you are interested in exploring certification for your future Riverbend home, please let them know of your interest in advance. We are proud to provide timeless designs you’ll fall in love with while combining them with the latest technology to craft homes. Contact us to learn more about our energy efficient timber frame homes and how you can modify your own custom design today. For additional information in the U.S., watch a video via the USGBC, “What is LEED?” here. Watch the City of Edmonton’s short explanation about the benefits of EnerGuide home evaluations, and how to get one, here. To see the drastic difference in energy loss in the home that uses SIP construction versus a conventional stick-frame house, visit our energy efficiency page. [i] the R in R-Value stands for “resistance”; when referring to insulation, this resistance is for heat.